Coach's Corner - Honus Wagner hand signed/dated vintage cut! Go Back to Lot List Honus Wagner hand signed/dated vintage cut! This vintage cut of light brown paper is in VG+/EX overall condition, and measures approximately 3x5 in size, making it ideal for matting and framing. 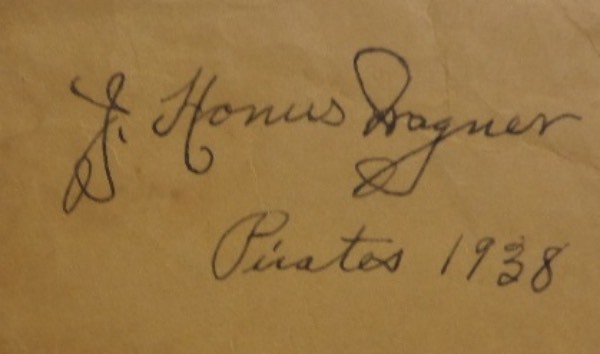 It is hand-signed in black ink by the Inaugural 1936 HOF Inductee, grading a legible 7, and including a Pirates 1938 inscription, and retail is high hundreds from this long-deceased MLB legend!